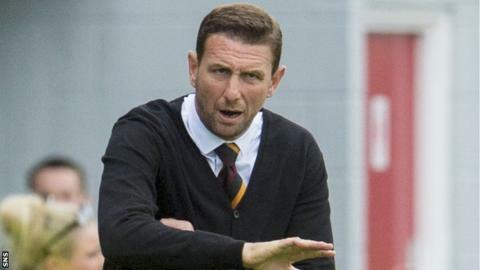 Ian Baraclough believes he helped lay the foundations for future success at Motherwell before he was sacked. The 44-year-old Englishman's side avoided relegation last season with a play-off victory over Rangers. But he exited last week following a Scottish League Cup defeat by Morton. "We worked extremely hard in the summer to put an infrastructure in place to allow the club to flourish in the long term," Baraclough said in a statement from management firm Oporto Sports. "These foundations will benefit the club for years to come, I am sure." Baraclough took charge in December after Stuart McCall was ousted following a poor start to the Scottish Premiership season. "Understandably, I am disappointed to have departed, but I am equally proud of my time at the club," he said. "When I joined, Motherwell were facing a difficult time at the foot of the Scottish Premiership. "That battle continued, but through the tremendous efforts of the players and staff, we were able to secure safety with a landmark 6-1 aggregate victory over Rangers FC in the play-off final." Baraclough, who departed with Well sitting second bottom of the table, preferred to concentrate on the positives of his experience at Fir Park. "Personally, I feel stronger for the experience of managing in the Scottish top flight, working within the typical constraints faced by managers at that level," he said. "It was a true privilege to work for a club with such a rich and proud heritage and my year at Motherwell is something I will never forget. "My football philosophy remains unchanged; I am committed to playing an attractive, attacking brand of football whilst helping to create a team that the club's supporters can identify with." Baraclough paid tribute to his backroom staff, and assistant manager Stephen Robinson, as well as the club's fans. "If they continue to support the new manager in the same manner as which they afforded me, I am certain that the club will show further progress and climb the division," he added. Motherwell have placed coach Stephen Craigan in interim control of the first team and hope to appoint a successor to Baraclough before Celtic's visit to Fir Park on 17 October.